Grew up… alongside childhood friends Haruka, Nagisa, and Rin. While all four of them were members of the same swim team as children, it is Haruka that Makoto has always been closest to: the two of them have known each other since kindergarten, and Makoto is used to taking care of his best friend. Living… in Iwatobi, a small coastal town in Japan. It's near the ocean, which gives Makoto and his friends plenty of opportunity to go swimming in the summer. Profession… high school student and captain of Iwatobi's fledgling swim club. As a new club, the swim team has a lot of hurdles to overcome, from recruiting members to proving their abilities in competitions. 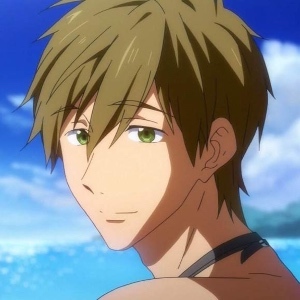 Makoto's not too worried about winning, however, saying, "What makes me happiest is that we can all swim together." Interests… cats, his siblings, and his friends. In addition to reining in Haruka's more abrasive eccentricities, Makoto tends to mother his other friends as well. It's an attitude that's won him the affection of his younger sisters, as well as many of the neighborhood strays. Relationship Status… single. Between classes, clubs, hanging out with friends, and taking care of his socially-challenged best friend, Makoto's schedule is too busy for romance. Haruka, especially, takes up a lot of Makoto's day, since he constantly has to stop his classmate from skipping school to swim or jumping into any pool he sees. Though Makoto doesn't seem to mind, telling Haruka that, "If you're not there... it's meaningless without you!" Challenge… leading his team to success. Makoto is a talented swimmer, but unless the Iwatobi swim club starts winning races, they might lose their status as a school club. Personality… kind-hearted, considerate, and nurturing, if occasionally fearful. Makoto is the captain of Iwatobi's swim club for good reason: he's caring, selfless, and levelheaded enough to deal with his more eccentric teammates. While he can be easily frightened by haunted houses or the ocean, if it means helping his friends out, then Makoto is more than willing to face any of his fears. Makoto Tachibana's popularity ranking on CharacTour is #315 out of 5,000+ characters. See our top-ranked characters and read their profiles.